This recent trend in purchasing behaviour begins with customers searching the internet for detailed product information – descriptions, images, reviews, price – on which their purchasing decision is based, and ends with the customer’s decided-upon item being purchased in a physical store. Researching a product prior to purchasing is certainly not a new concept but it’s more prominent now due to internet and mobile. Buyers have access to more information than before, and because e-commerce has made it possible to buy from sellers worldwide, buyers also have more purchase options. To really understand just how much online access has influenced sales over the years and will continue to do so, we need to talk numbers. In 2011, websites drove 10% of offline purchases. By 2021, online channels will impact 41% of U.S. and 38% of E.U. offline retail sales. Mobile touchpoints have intensified this growth with 62% of in-store shoppers using their phones to look up product information before making a purchase. But online research doesn’t stop once customers are through your business’ doors, with 82% of smartphone users consulting their phone on purchases they are about to make in-store. Percentage of shoppers who read reviews before purchasing in-store for specified product categories. 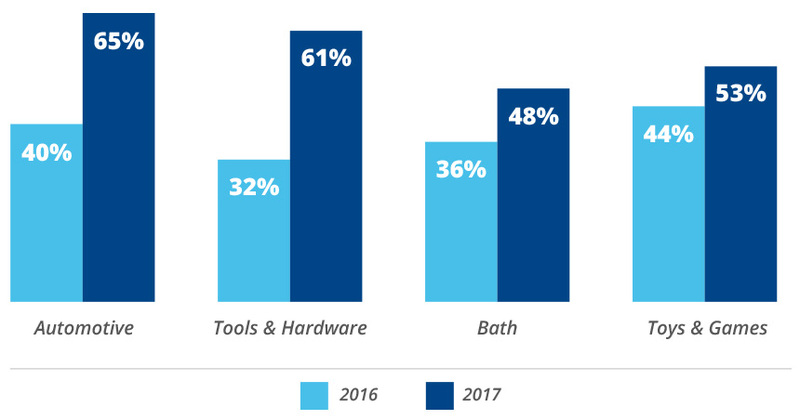 We reached out to DIY and Home Improvement experts to learn how new industry developments have affected their e-commerce strategy. In this webinar, we will share their insights and provide 5 solutions to get you ahead of your competition. Provide customers with content that will help them purchase with confidence. Deliver an enjoyable shopping experience through automatic recommendations of products and categories for those in search of inspiration. 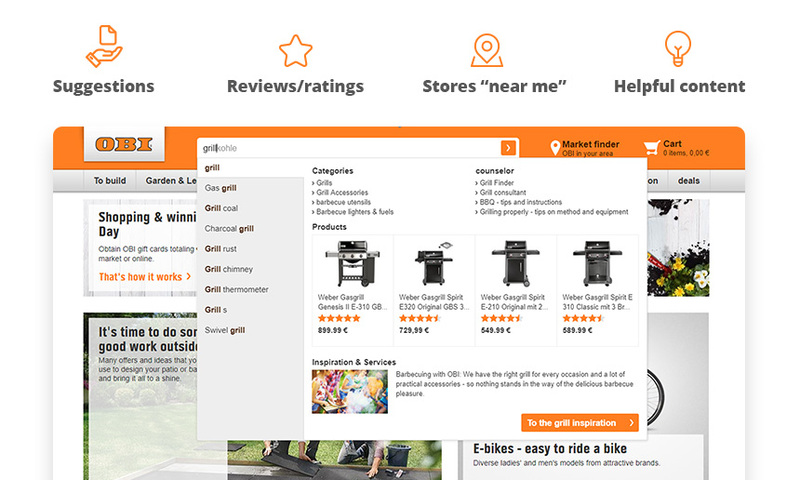 Create a page to educate shoppers with how-to guides, tutorials, and helpful hints. Implement digital assistants to support visitors with queries and turn to consumer-generated content to help indecisive visitors become active buyers through ratings and reviews. Providing these services in the form of content will change how your online visitors engage with your brand. Store searches are no longer just location oriented, they’re about a specific thing, in a specific area and in a specific period of time. Supply customers with all the details concerning local stores: working hours, directions, contact number. As well as helpful information about the item they intend to buy: price at a nearby store, coupons or deals that may apply, location of closest store with item in stock, what other items are available. Simple local information can motivate store visits. OBI has capitalized on this growing trend. As the largest DIY retailer in Europe and the third largest in the world, they are well-represented with over 580 store locations but they recognized local presence wasn’t enough. Which is why the company focused on a digital strategy aimed at providing visitors with inspiration for home improvement projects and incentives to buy in the local market. OBI’s search and navigation provides visitors with the services they want in the form of content. For those looking to be inspired, OBI provides product suggestions and creative content. For those who want specific information, store locations and nearby product prices are readily available. 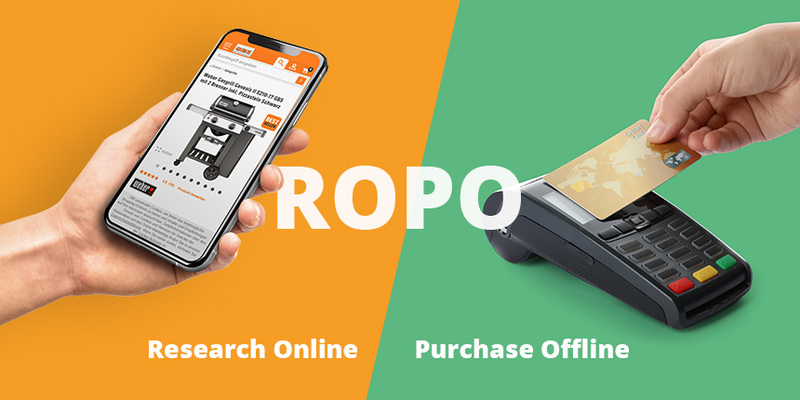 The way to approach ROPO is not to try and replace your existing business model with an online one, but rather enhance it.